Welcome to a Becoming A Modern Man! 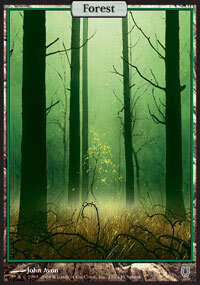 In this article I will be looking at one of the Top Tier decks of the moment, Mono-Green Tron. Tron has been a staple of the Modern scene since very early on in the format and different variants have come in and out of fashion. 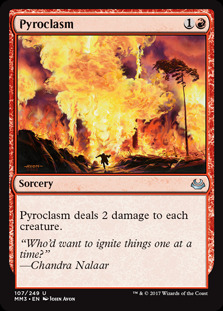 For a very long time, RG Tron was the preferred option with Grove of the Burnwillows fueling sweepers like Pyroclasm . With the arrival of Fatal Push , GB Tron started becoming the favoured version of the deck. 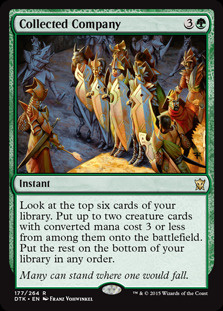 These days Mono-Green Tron appears to be the most popular version. I think this is largely due to the increasing presence of cards like Field of Ruin and Blood Moon running around in the format. Mono-Green Tron is heavy on basic lands and can cast all of its spells once it has a Forest in play which makes it more resilient against the hate cards running around. The list I am using actually dates back to Pro Tour Rivals of Ixalan. This list was played by Eder Damasceno to an 8-2 record at the Pro Tour. 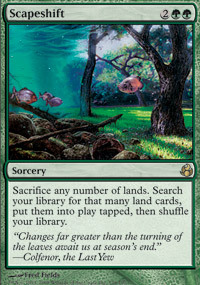 The list is slightly dated in that sense but really not a whole lot has changed since then in Mono-Green Tron lists. You will see from the gameplay videos that I have messed around with a few of the sideboard slots but otherwise my list is pretty much the same as Eder's. 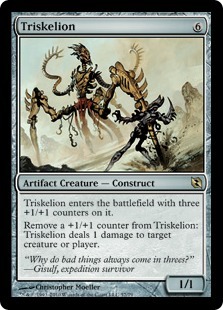 Triskelion 's younger brother is an extremely powerful addition to Tron. You can cast Ballista at varying costs as required. Sometimes it is a 2-drop just as a chump blocker to soak up pressure or to ping off a Dark Confidant or Young Pyromancer . 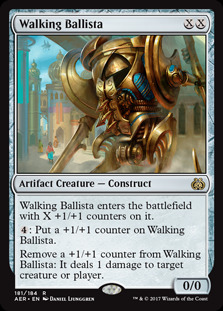 Sometimes it's a 2/2 or a 3/3 and later in the game you can make Ballista huge and it can just win you the game. It fills a lot of roles and is incredibly versatile. 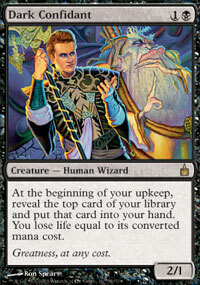 A very welcome addition to the Tron deck. Wurmcoil Engine is a very powerful colourless creature and one that is difficult to answer effectively. Barring a Path to Exile there are not many cheap and efficient ways to answer a Wurmcoil Engine as it produces tokens if it goes to the graveyard. 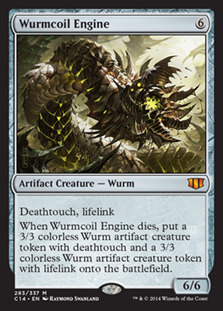 The Lifelink on Wurmcoil Engine also means it helps shore up the deck's natural weakness to fast aggro decks. It is very tricky to attack profitably through a Wurmcoil. 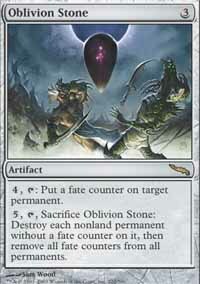 World Breaker is another top end threat that provides an answer to various problem cards. 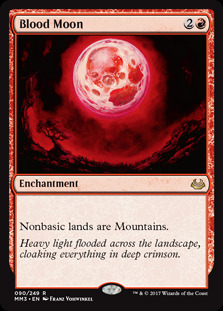 World Breaker is an answer to Blood Moon , Chalice of the Void and various other problem artifacts, enchantments and lands. Also, at worst you can exile a land and you have a 5/7 with reach. World Breaker is also actually one of only two creatures in the deck that can block flyers. 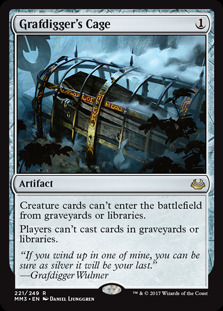 It's actually pretty rare that World Breaker dies once hitting the battlefield but if for any reason it does end up in your graveyard, there is the lesser used ability of returning it to your hand from the graveyard. This can actually be very useful if you are light on threats and allows you to exile another one of your opponent's permanents. 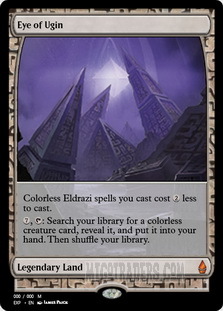 Since arriving in Battle for Zendikar, Ulamog, the Ceaseless Hunger has become the huge Eldrazi of choice for Tron decks. Exiling two permanents is pretty devastating for an opponent and then there is the little matter of dealing with an indestructible 10/10 that exiles about a third of your library when it attacks. Ulamog certainly has a way of ending the game in a hurry. Ulamog can be handled with a Path to Exile or a counterspell but you have already got a decent amount of value off the double exile which triggers when it is cast. 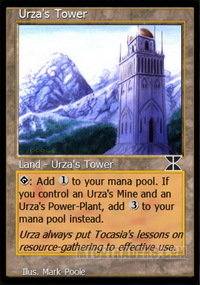 Also, although the 10-mana casting cost may seem steep remember that Tron can produce 10-mana with as little as 4 lands - 2 x Urza's Tower , Urza's Mine and Urza's Power Plant . I am sure it was never intended for Ulamog to be a four or five-drop but that's very achievable for Tron. 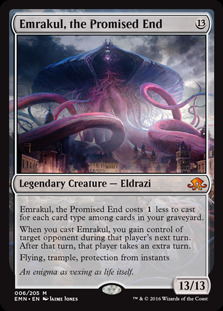 I am still unsure on including Emrakul, the Promised End in the deck. 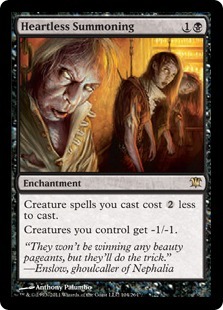 It does have a tendency to win the game but at the same time Tron actually isn't a great Delirium deck. Yes, we do put artifacts readily into the graveyard readily and there are a good number of sorceries but after that it become a bit more tricky. Accordingly, I find Emrakul usually costs 11-mana which when you compare it to Ulamog, the Ceaseless Hunger at 10-mana doesn't seem that favourable. 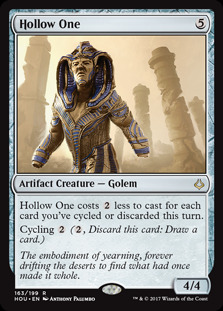 I might be tempted to swap this out for a third Ulamog or even a third Walking Ballista . I have seen some list play a fourth Oblivion Stone in this spot which is another option. 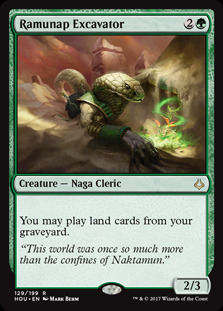 Ancient Stirrings is a very powerful draw spell that allows you to look at the top five cards of your library and pick our a land or colourless spell. With high number of lands and colourless spells in the deck Stirrings is pretty much guaranteed to hit and can realistically find any card we need. 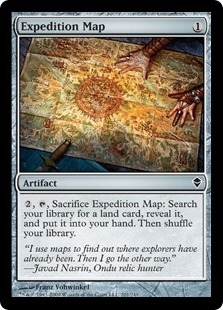 Early on you are often looking to find Tron pieces or cards like Expedition Map to allow you to find Tron. 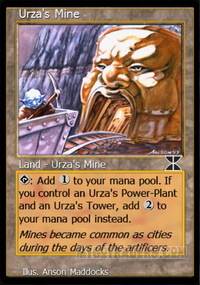 Once you have Tron online then Ancient Stirrings can find your big mana spells, such as your Eldrazi and Planeswalkers. Being able to search up the land of your choice is obviously something this deck is desperately looking for. 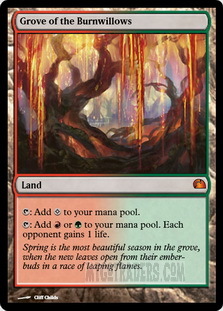 Usually Sylvan Scrying finds a Tron piece but it can also be used to find Ghost Quarter and sometimes it is even right to just find a Forest . 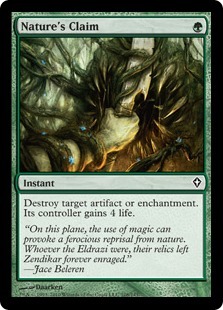 A deck that only runs Green and Colourless spells is obviously going to have some trouble with targeted removal. Dismember gives us a spell that can deal with powerful creatures that can land early such as Tarmogoyf and Tasigur, the Golden Fang . Map is a key card for Tron as it is one of the easiest and cheapest ways of finding a missing Tron piece. Turn 1 Tron piece into Map into Turn 2 Tron piece search for the last Tron piece is a very common and easy way to set up a Turn 3 Tron. 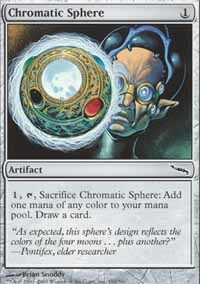 The Chromatic artifacts act as cantrips for the deck and also a way to make green mana when, ideally, we want to play Tron lands each turn. 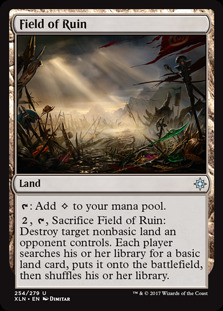 These are very much key as they dig us deeper into the deck to find the cards we need and also produce the mana we need to cast spells like Ancient Stirrings and Sylvan Scrying . 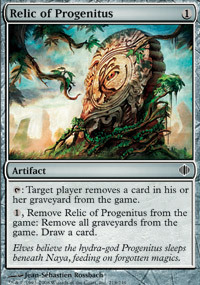 The misers copy of Relic of Progenitus . 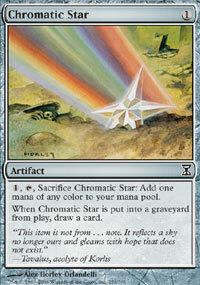 There was a time when Tron decks were running a lot more copies of Relic in the main deck. There are a lot of decks looking to get up to graveyard shenanigans - be it Delve creatures, Snapcaster Mage s, flashback cards, Dredge or reanimator. 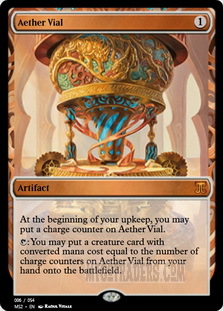 Relic acts like the Chromatic Star /Chromatic Sphere in it's another cantrip artifact but has the benefit of being very painful for some other decks. 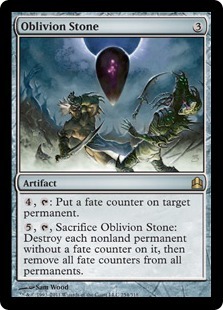 Oblivion Stone is a very powerful mass removal spells that not only destroys creatures but all non-land permanents. Without Tron it can be a bit slow but even if you have to do it the hard way, clearing the board on Turn 5 can be enough to buy you the time to take control of the game. The dreaded Turn 3 Karn is something that haunts Modern players nightmares. It is exaggerated as to how often you actually manage to get a Turn 3 Karn but certainly hitting a Karn early can be devastating and in a lot of cases game breaking. Karn is very impactful as it lands and can immediately exile a permanent or tick up and exile a card from an opponent's hand. Karn's high loyalty also makes it difficult to remove through combat damage. It is very rare that you need to ultimate Karn as if you get to the point where Karn has been ticking up for multiple turns you are probably well ahead already but you can restart the game if you so desire. Ugin is Karn's slightly more expensive partner-in-crime. 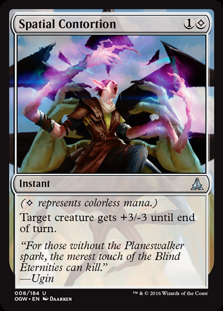 Another incredibly powerful planeswalker. 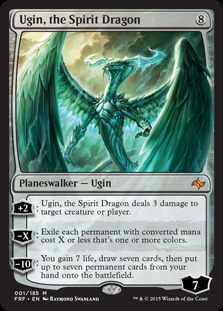 Ugin is usually able to clear an opponent's non-land permanents while remaining on a healthy enough loyalty count to carry on. 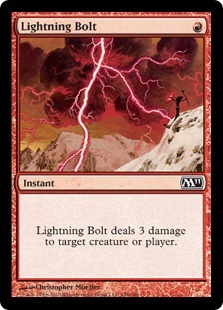 Alternatively, you can start Lightning Bolt ing creatures or people and building towards his powerful ultimate. 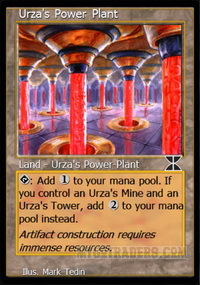 The Urza Lands, also known as Tron lands, are the engine for the deck. With a copy of all three on the battlefield Tower taps for 3 mana and Mine and Power Plant tap for 2 mana each. This means you can have 7-mana as early as Turn 3 and even larger amounts thereafter. Since losing Eye of Ugin , Sanctum of Ugin has been the replacement of choice. 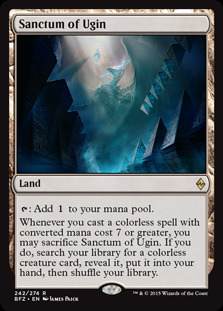 Sanctum allows you to tutor up a colourless creature from your deck. This is a nice way to find an Ulamog to finish up the game or some other huge creature to seal the game. 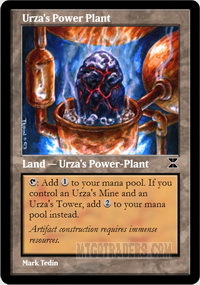 Once you have established Tron you can take advantage of your excess ways of searching up lands to find utility lands such as Ghost Quarter . Ghost Quarter is good at fending off opposing Tron decks, dealing with creaturelands and getting rid of Azcanta, the Sunken Ruin. 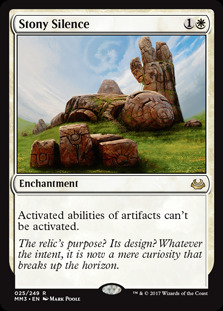 Nature's Claim is a very cheap answer to problem artifacts and enchantments. It is very good against Affinity, Lantern Control and Blood Moon decks for example. It's also an answer to Stony Silence which is probably one of the more crippling hate cards that opponents can bring in against us. 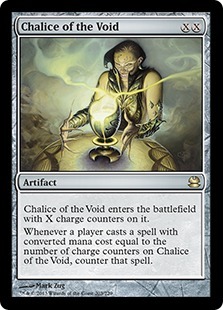 One weakness to only running Nature's Claim is it cannot answer a Chalice of the Void for 1, which is actually quite a powerful play against Tron. 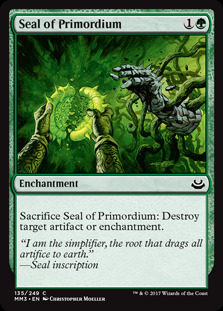 It's possible that it's worth adding another slightly more expensive artifact/enchantment destruction spell like Seal of Primordium for that reason. Thragtusk is the decks answer to some of the more aggressive decks you will face. Thragtusk is good for the same reasons it dominated its time in Standard. Gaining 5 life is a pretty huge swing back in your favour and you then have a threat that replaces itself. It's difficult to deal with Thragtusk profitably as even if it is instantly removed it will leave a 3/3 token in its wake. 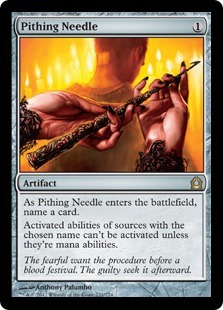 Pithing Needle turns off a lot of different and relevant cards in the format. 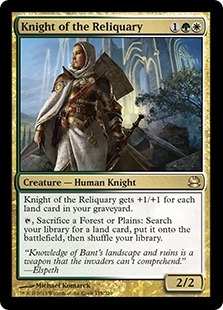 Planeswalkers are the big targets but it can also deal with various other cards including AEther Vial , Knight of the Reliquary , Codex Shredder and even fetchlands. Very strong against planeswalker focused decks and Lantern Control. 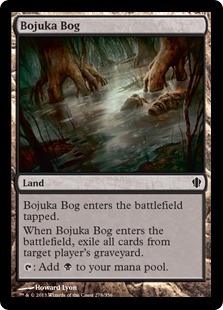 Bojuka Bog is a utility land that we can tutor for once we have established Tron or earlier if there is a pressing need. Having graveyard hate that you can bring in in exchange for a land is nice. Spatial Contortion is another removal spell. 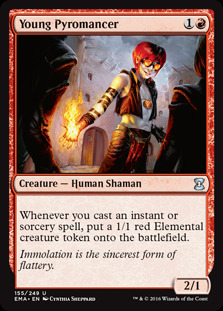 Early creatures like Young Pyromancer and Dark Confidant can cause us a lot of trouble so it's good to have additional removal options. 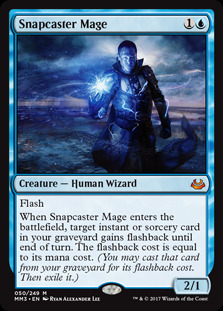 Warping Wail has a lot of uses and can be removal, countermagic against cards like Scapeshift or it can create a blocker. 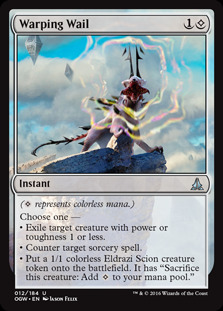 Additionally you can use the Eldrazi spawn to ramp you if required. Wail offers a lot of options and is a solid sideboard card. 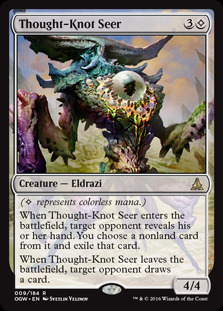 Thought-Knot Seer gives us a nice sized creature that also lets us disrupt our opponent, which is particularly useful against Control and Combo decks. I also like bringing in Thought-Knot Seer against aggressive decks or decks where you anticipate there will be a lot of attempts to disrupt your Tron. Having a creature at a more reasonable cost can be helpful to provide board presence in these types of matchup. 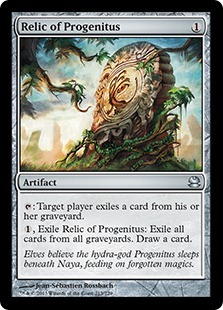 Grafdigger's Cage and Relic of Progenitus provide additional graveyard hate. Cage turns off flashback cards, Collected Company and other reanmination strategies. Relic supplements our other ways of emptying the graveyard and can also cantrip. Our first matchup is against Hollow One. Their deck can be very explosive but it's also pretty high variance. They aren't really interacting with us so if we can get Tron then the majority of our creatures outstrip theirs once they hit the battlefield. It's a bit of a race really. Post-board we can bring in Nature's Claim to kill Hollow One and Blood Moon if they bring that in. 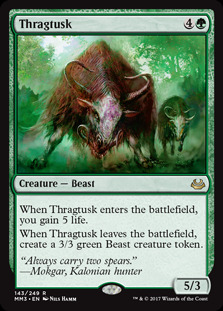 We also have Thragtusk which can trade with all of their big creatures while also giving us a healthy life boost. Our second matchup is a mirror match. This matchup is kind of a race to Tron. Obviously the first person to stick a Karn Liberated or something of the like is likely to be the winner. 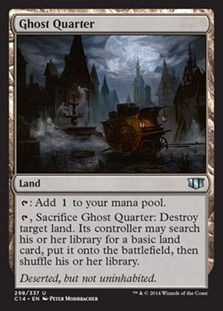 It's also worth noting that once you have Tron you can search up Ghost Quarter to disrupt your opponent's Tron. Our third matchup is against GB Value. This deck is sort of a variant on the Selesnya Value deck I covered a few articles back and I think Todd Anderson was involved in innovating this deck too. The deck is actually more focused around Heartless Summoning which can be very powerful if they stick it early. This match was very close and if they can put together the Ramunap Excavator /Ghost Quarter combo together it will make life very difficult. If you want to see more of GB Value, Corbin Hosler recently did a series of videos on the deck. Our fourth matchup is against the UW Spirits deck I was playing in my last article. 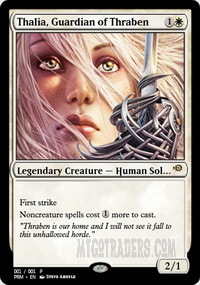 They have a lot of flyers, which can be problematic for us and cards like Thalia, Guardian of Thraben and Leonin Arbiter which can disrupt us. 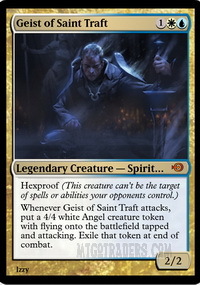 Also, this version runs Geist of Saint Traft which can kill us pretty quickly if we stall. I think this matchup largely comes down to whether they are able to disrupt us and apply a good amount of pressure long enough to pick up the win. Once we start dropping our haymakers it become pretty hard for them and cards like Wurmcoil Engine are tough for them to deal with. Post-board you can bring in Thragtusk to make their lives that much harder. Our final matchup is against Mardu Pyromancer, which is the deck that Gerry Thompson took to the Top 8 of Pro Tour Rivals of Ixalan. This matchup felt pretty good. The real problem is that their deck is able to go wide with cards like Young Pyromancer and Lingering Souls . If we aren't able to answer an early Young Pyromancer life can be very difficult. However, their less aggressive hands are much easier to beat and I think we are pretty favoured in this matchup. There is a lot of hate surrounding Tron. I see on Twitter and other sources people complaining about Tron fairly regularly. I think this largely surrounds the whole Turn 3 Karn scenario which feels very bad for opponents. Tron is certainly a very powerful engine but I do not think it's every really reached a point of being overpowered in the Modern metagame. Personally, I really like Tron as a deck and I like that it lets you play such flashy and powerful spells, creatures and Planeswalkers. Also, as it stands it's probably the Top Tier deck that I am most comfortable piloting in the current Modern metagame. The deck can power out huge powerful creatures and Planeswalkers that go over the top of anything your opponent is doing. The deck is more resilient than it may seem. Unless it is accompanied by a good amount of pressure a single hate card is unlikely to be sufficient to derail Tron thanks to the multiple search effects in the deck. Additionally, even if you cannot put together Tron if your opponent doesn't apply pressure you can get to a stage where you are just hardcasting your big spells naturally. It is very possible to win a game where you never put Tron together. Has a very strong matchup against Control decks and any of the slower decks in the format as given the time Tron will just go over the top of anything the opponent is doing. Lantern Control isn't the bogeyman it was when it won the Pro Tour but Lantern is a very good matchup for Tron generally. Very aggressive decks can be a problem. The deck does not have a lot of early interaction and so speedy aggro decks are problematic. 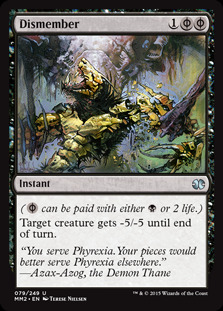 Matchups like 8-Whack Goblins, Burn, Affinity and Infect can be tricky. Combo decks can also be a problem as again our ways to interact with combos is limited. 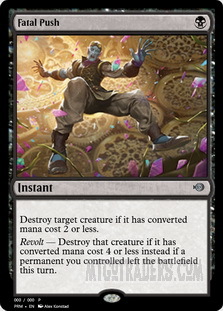 However, any combo that requires some number of permanents on the battlefield gives us a chance to disrupt it with cards like Karn Liberated or Ulamog, the Ceaseless Hunger . Accordingly Storm is probably the combo deck that proves most problematic. 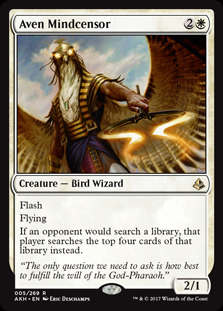 Cards like Leonin Arbiter and Aven Mindcensor that prevent you searching your library can be a problem. 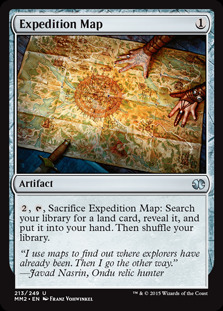 Expedition Map and Sylvan Scrying are important cards for finding our Tron pieces. There is quite a bit of main deck hate running around in the current metagame. Main decks Ghost Quarter s and Field of Ruin s are not uncommon and Blood Moon decks also pose a problem. I think that Mono-Green Tron is a powerful Top Tier deck that has been around for a long-time and is well worth getting to grips with it. I would certainly say it's my favourite deck of the moment.